Here’s the thing about October: it’s over tomorrow and I forgot to watch any Halloween movies. Last year I had much more Halloween spirit. I watched Hocus Pocus and Beetlejuice and Double, Double, Toil and Trouble and The Nightmare Before Christmas! I gave kittens names like Pumpkin and Pie and Scarecrow! This year all I did was bake a few pumpkin flavored things and occasionally wear an orange sweater. Oh well, there’s nothing I can do now. Bring on the Christmas music! 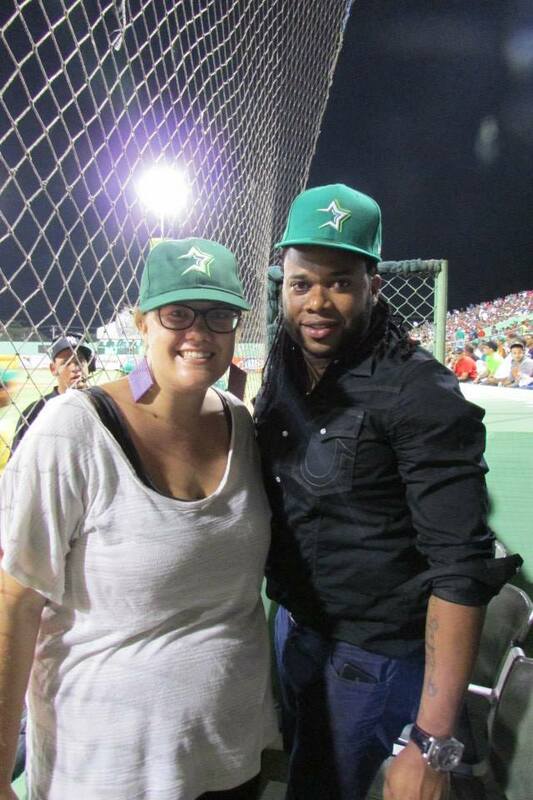 Dominican baseball starts in October, which means plenty of opportunities for pics with pro ball players! This guy is Johnny Cueto, a pitcher for the Cincinnati Reds who is from San Pedro! Emily Gilmore Vs. Lucille Bluth: A Six Bracket Battle at BuzzFeed – In honor of Gilmore Girls coming to Netflix. A Momma’s Heartfelt Thank You at Not The Former Things – LGLP, man. Downton Abbey on Netflix – Of course I’d heard of Downton Abbey and of course I’d thought about watching it and of course I finally started watching it and of course I watched it obsessively for a couple of weeks (it’s a little hard to watch obsessively though because you’ve really got to pay attention) and of course I fell in love with sweet William and cheered for Anna and Mr. Banks and developed my own feelings for Mary (blegh) and cheered again for Sybil and the chauffeur… but then my interest kind of pilfered out. I’m sure I’ll head back sometime soon but I became surprisingly bored by the Bates’s and I just really don’t like Mary so the fact that she gets to be with Matthew upsets me. I’m glad I met the chaps at Downton though, and I hope I stop by again soon. Mamma Mia on DVD – I saw this one in theaters and was kind of disappointed that I had paid money to see it. Watching it at home for free while grading papers was a slightly different experience. It’s a little silly, of course, but it’s fun. The Voice – I got to watch one glorious episode of The Voice on an actual TV. It was awesome and confirmed my suspicions that if I had a TV with cable I would never get out from in front of it. Raising Hope on Netflix – Netflix has a new season of Raising Hope so I thought I’d go back to the beginning and watch ’em all but (as I already knew from watching it in real time) they just aren’t as good after Season 1. Sigh. Oh well. Once Upon A Time on Netflix – On Sunday I bought a puzzle and I wanted some good background noise. Of course I’d heard of Once Upon A Time (like I’d heard of Downton Abbey), but I wasn’t a fan of Dr. Cameron when I binge-watched House (eh hem, twice) I didn’t think I’d like it. My roommate assured me I would and guess what? I do! It’s perfect for watching while puzzling. I use the need-to-pay-attention moments to rest my eyes and my back. I hate that David had to break up a marriage to be with Mary Margaret (and what is with these names?) but it’s magical and pretty and I actually love Emma (Jennifer Morrison aka Dr. Cameron) so no worries there. Also, is there anything more precious than the (albeit adulterous) Ginnifer Goodwin as Snow White? Fairest in the land, indeed. The Onion Reviews ‘The Hunger Games: Catching Fire’ – Just watch it. Kopecky Family Band – I have Spotify again, which is great because the Kopecky Family Band only has like, five videos on YouTube. They’re spunky and fun guys. I’m digging bands with a fella and a chick leading the way (see: Of Monsters and Men’s My Head Is An Animal on repeat for all of September). Ed Sheeran – I’m a little late to the bandwagon, but I think there’s room. Ed’s precious. I’ve been listening to all Spotify has to offer of his. Behind the Beautiful Forevers by Katherine Boo – Holy crap. True stories from a slum in Mumbai. Commentaries on the distribution of opportunity and extreme poverty. Please read it. Animal Dreams by Barbara Kingslover – After two books, I think it’s safe to say Kingslover is one of my top ten favorite authors. Laughing at My Nightmare by Shane Burcaw – This one isn’t super well written, but Shane is a great guy (from what I’ve seen on the internet) and his is a great cause to support. Also, this book is straight up laugh out loud funny if you’re looking for a pick me up. Let the Great World Spin by Colum McCann – Something I like to do is write about characters without naming them. Which is something McCann likes to do too, I gather. It was nice seeing that technique used by a pro. I picked up a few pointers. I also picked up some pointers on narration because this guy is really good at it. There are various narrators in this novel and the story flowed seamlessly from one to another. It was clear from sentence structure and vocabulary and you know, feeling, when someone different was narrating and who they were. And all of their stories wove together and centered on this one event and bumped into each other and passed each other on the street and there was never an, “OH! That’s who she is!” moment but rather several, “Of course, mmhmm,” moments that are much harder to communicate and much gentler to receive. I’d love another Colum McCann book in my life. Count of Monte Cristo by Alexandre Dumas – I started this one very optimistically. I had seen the movie and loved the story and despite its intimidating length, I moved through the first few chapters quickly. But now he’s out of prison and I’m bored. So I’m reading The Hitchhiker’s Guide to the Galaxy instead and putting the Count on hold. It’s on my list, so I’ll go back and finish it eventually (because I can’t just leave something crossed off a list!!) but for I’m moving on. Get it?! A keeper! Hah! 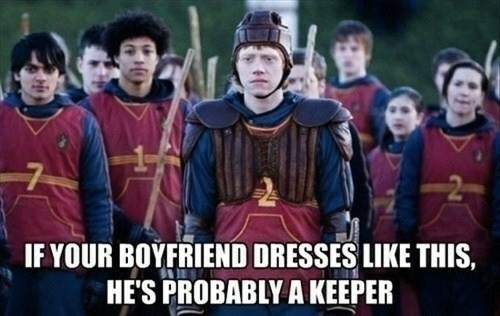 Okay, I just about died laughing at that picture of Ron. Also, I totally felt the same way about Once Upon a Time. I love the show, and I loved Mary Margaret, but I didn’t like the whole adultery thing they pushed on her. Unnecessary. Thanks for the mention! And for all the other awesome posts to check out! Isn’t it the best?! It was included in a list of 20-something pictures that only HP fans would appreciate but it was far and away the best. Wow! That was some information overload! I did pick up random stuff from up there, what brought me here was the picture of Ron! Aahhh!!!! And Behind The Beautiful Forevers! What made you read that book? Who recommended??? Imma check out the Catching Fire thingie you’ve linked now. Okay, that’s all I had to say. I used to do a weekly internet round up but that seemed like too much. I suppose this way is too much in another way! I gave myself a Book Challenge (70 books in 1 year) and Behind the Beautiful Forevers was on the list! I found it searching around on Amazon and GoodReads for books people like. I’m really enjoying The Hitchhiker’s Guide. It’s really silly and fun. I read a kind of textbook about writing fiction, particularly sci fi and fantasty, and the author of The Hitchhiker’s Guide showed up a few times so I thought I should check it out. Please watch that video. It’s hilarious. I’m excited to check out your blog! I need more Harry Potter things in my life.